#11: A New Mom in the Bay! We know that 21 calves were documented this winter in the coastal waters of Georgia and northeast Florida (the primary calving ground for the north Atlantic right whale). However, it is always exciting to see these moms show up in the Bay of Fundy with their calves. It gives us an opportunity to sample (a skin sample for genetic work) the calf if it was not already sampled in the calving ground over the winter and also to fully document the calf from a boat based platform. The digital images obtained at this age are very important in our ability to later photo identify these whales as individuals. Right Whale #1123, Sonnet (top) and Sonnet's calf (bottom). Finally on August 30 it seemed like we had a stretch of good weather coming our way. 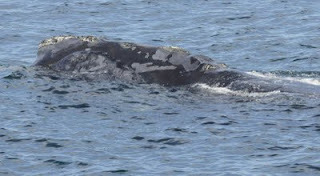 We got on the water on August 30 (our first day out since the hurricane) and had right whale #1123 (Sonnet) and her calf. 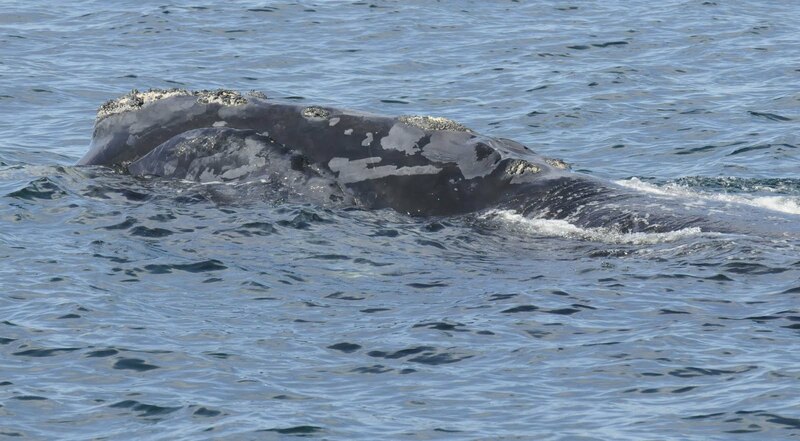 Sonnet and her calf had been seen for the first time in the Bay of Fundy this summer just a few days earlier by a whale watch boat. This sighting was very exciting as we were able to obtain a much needed (but small) skin sample from her calf. We're hoping we'll soon see some other mom and calf pairs new to the Bay! #21: New 2011 Mom Sighted! #16: Whale Blow, Chapter 3: THAR HE BLOWS! #12: Four days in a row!